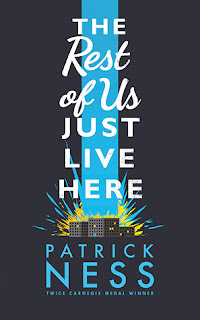 The Mountains of Instead: As I Try To Make My Way to The Ordinary World - Review/Interview: Patrick Ness on The Rest of Us Just Live Here. 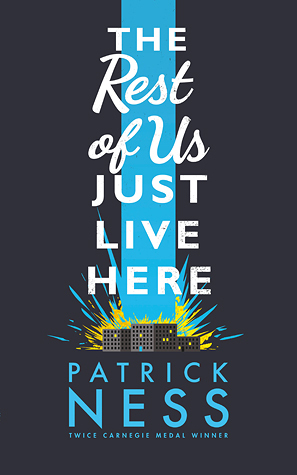 As I Try To Make My Way to The Ordinary World - Review/Interview: Patrick Ness on The Rest of Us Just Live Here. We're both fortunate and delighted to welcome Patrick Ness back to these here hills to talk about his new book The Rest of Us Just Live Here. The Rest of Us Just Live Here takes the idea of a Chosen One (Harry, Buffy, Katniss, whoever) and asks: what about everyone else? What about the kids just trying to make it to graduation? What about the boy trying to figure out where he fits in while desperately hoping that his school stays intact this year? Protagonist Mikey is just that boy and as another Chosen One fights another battle that may or may not end in the apocalypse, Mikey has his own battles to fight, his own mundane existence to navigate and his own extraordinary, ordinary life to live. As a riff on the Chosen One genre, The Rest of Us Just Live Here is both clever and extremely funny not to mention pretty meta. For all of you out there who have ever loved a Buffy, an Elena, a Clarke or a Clary (not to mention a Jace, a Percy, a Katsa or a Sabriel - Ness really has a point about these names), the opening sections of each chapter will resonate loud and clear while also making you laugh to the point of tears. However, The Rest of Us Just Live Here isn't a Chosen One book, it's a contemporary story about one boy figuring out how he fits into his own life. It is a story that will speak to all those who have ever felt like the least important, the lesser friend, the hardest work. 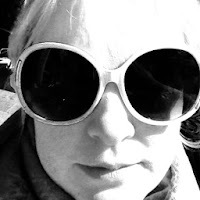 It will speak to teenagers and adults alike in that we have all felt ordinary in an extraordinary world, all felt insecure and all negotiated the kind of close friendships that require the best kind of hard work. Finally, The Rest of Us Just Live Here is about family - the ties that bind. Ness writes the relationship between Mikey and his sisters in a way that is both hopeful and life-affirming and it is a pleasure to read a book that focuses on a bond that is so often passed over or written into cliche. 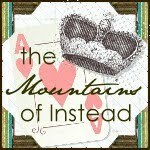 It is with great pleasure therefore, that we at Mountains of Instead, are able to recommend yet another Patrick Ness book without hesitation. He's our favourite, he really is. 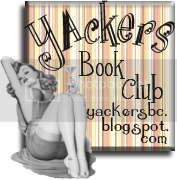 For those of you just coming across him for the first time, you can find reviews of his earlier work and a previous interview he kindly granted us by clicking on the Patrick Ness label at the bottom of this post. Read the reviews, then buy all the books because they are the kind of books you will want to have on your shelves FOREVER. For those of you returning to his writing, you won't be disappointed: go out, buy this book and set aside a couple of days. You're welcome. This interview/review were brought to you by Splendibird. Thank you to Patrick for interviewing himself so gallantly and to Walker Books for providing us with a copy of this title for review. Finally, thank you to Sholto, best baby brother, for editing the video. The Rest of Us Just Live Here is available TOMORROW (27.8.15).